I know that the image below was only an ad in the latest issue of Ivy & Piper, but for me it was a mini interiors spread. Don't you just love everything about this Black & Spiro's ad? 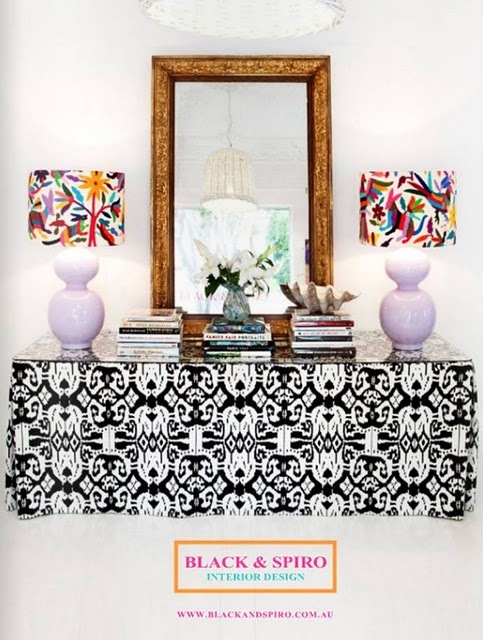 My favorite part has to be the colorful lamp shades made out of Otomi fabric. Otomi fabric can be rather pricey and the thought of having to cut up $300+ coverlet is not appealing to me, but a less expensive solution would be to purchase a table runner for this project! 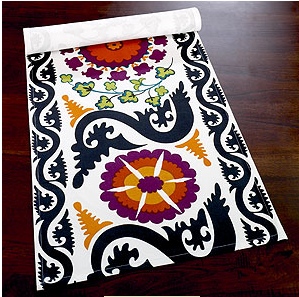 This table runner is only $80 and it would easily cover a couple or a bunch of lampshades depending on the size. For a similar look and for even less $$$ I would go with this table runner for $25. Now all you need is a pair of scissors and a glue gun and you are in business. My favorite thing about all of these new shelte mags popping up online is that even the advertisments are inspiring -- that one especially! Beautiful fabric...I especially like your affordable pick. Great work! Good lord, that is a gorgeous table runner. But why do I think $80 is still too much for a table runner? But if you make lampshades out of that table runner it all of a sudden makes more sense. Two lampshades, $40 a pop? Awesome. I love Otomi fabric! Just wish it was a leeeeetle bit cheaper! Now those lamp shades have just doubled my love of the fabric! Oooh - I love those lamp shades. I also really love that World Market table runner. It would be so perfect in my dining room/library. Love this image. And I kinda want the lamp bases to be light purple. I had this exact thought when I saw this pic because I'm obsessed with how to get sme Otomi in my life without springing for the coverlet. My only issue is the way the runner is oriented, wouldn't all the birds, etc in the print end up sideways on the shade? That would bother me. Or maybe I'm not looking at it right? Would love your input because I'm dying to do this! love it. good call on the table runners. The World Market Suzani is perfect for my entry! So glad you posted about it. I've been looking for something to either cover a lamp shade or the drum shade that will be handing in my entry very soon. I have the drum shade just need to talk the hubs into taking down the UGLY brass carriage pendant. I just wrote a post on how you inspired me with this post to do this DIY project. And of course linked back to you! Thanks for the great idea.